Food, Glorious Food. And Sports. What’s the next thing I’ll eat? I ask myself this question as I sit here—frustrated because I’d love to put my grades into Power School, but Power School is “either too busy or the site is down for maintenance”—in my comfy, slightly strange chair, which is next to my stack of “currently reading” books. Among comic books (like Wonder Woman, Aquaman, and The Breathers), at least one fictional text (The Absolutely True Diary of a Part-Time Indian), and several other random nonfiction books dealing with gender and theology (Nobody Passes: Rejecting Rules of Gender and Conformity and John Wesley’s Sermons) are many nonfiction texts about food. From cookbooks or food magazines to theoretical texts, my book collection has recently gained quite a few texts dealing with how food is used and interpreted in culture. These books were part of my dissertation preparation and background knowledge, but now they are just books for pleasure. For fun (mind you), I am currently reading books like Bite Me: Food in Popular Culture and The Anthropology of Food and the Body: Gender, Meaning, and Power, and Eating Culture. I will admit it: I think about food almost constantly. I know it’s a semi-charmed kind of first world life I lead when I can sit around, pouting about not being able to enter my grades on the computer, thinking about what I might whip up for a snack while I work. Last night I made glorious bison burgers for dinner, because I’m doing the Whole 30 to try to jumpstart my metabolism again and to get rid of the foods that I think are causing me the most pain. The picture doesn’t do justice to the amazingness of these burgers and their artistic presentation. 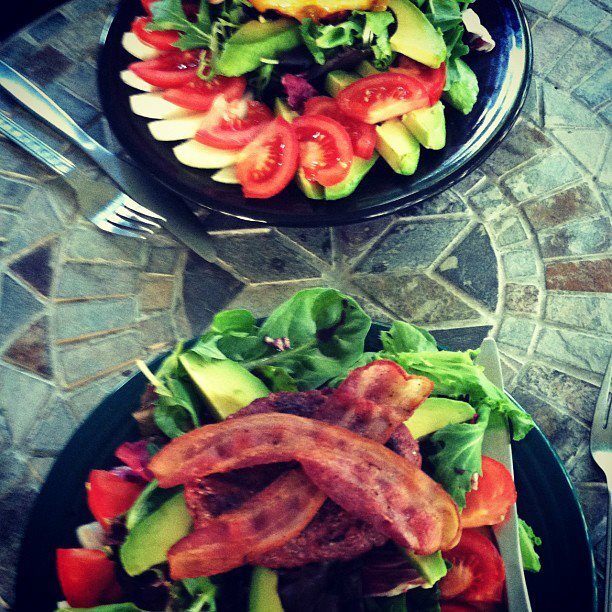 They were half-pound charcoal-grilled bison burgers with spring greens, avocados, onions, tomatoes, and bacon. I drizzled mine with a bit of balsamic vinegar just to set off the taste of the onions. I had a banana for desert. We ate outside on the porch at our new slate table. The weather was perfect. The food was delicious. The evening was wonderful. The only thing that made the day more wonderful was I got up this morning and was tempted to weigh myself. I’ve lost five pounds in two days by cutting out sugar and dairy. I can’t say I could live this strictly forever, but it feels pretty good to cleanse my body and to lose a bit of weight. I told my brother, last night, that I am trying to focus more on how I feel, how fit I can get, and how my clothes wear than I am trying to focus on weight, but I couldn’t resist just seeing if there was any difference. Now I know, so now I won’t weigh myself again until June 17, just before I leave to go to Florida. I am “training” for a half marathon in July, but I haven’t done much running lately. I’ve done more walking and biking than anything, so I need to make sure to pick up the running, making sure to do a good portion of it barefoot. I just sent out a check to Tuhey Pool, to join their outdoor pool lap-swim program for the summer, because I also want to do a triathlon at some point before I turn 39. I’m hoping to do this triathlon in September of 2013. It only cost $75 for the whole summer and I can go for lap swim and for the regular swimming time later in the day after I’ve done the other work I need to do. I never feel like the summer is long enough, and I always feel like I have so much to do. This summer is no exception, but I do know I want to get in lots of exercise and lots of clean, healthy eating. I want to look hot when school starts (I mean not that I’m not super cute already). We’ll see where this goes. This entry was posted in Barefooting, Biking, Cooking, Fat, Food, Goals, Mental Health, Paleo/Primal, Photos, Play, Running, Summer, Swimming and tagged Barefoot Running, Barefooting, Biking, Bison, Burgers, Cooking, Fat, Food, grilling, Paleo, Primal, Running, Sports, Swimming, Weight Loss, Whole 30. Bookmark the permalink.